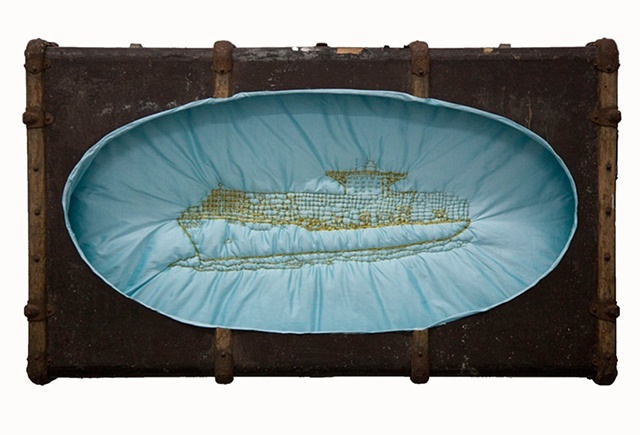 Lauren Hartman is an Oakland-based mixed media artist. Her fascination with the sea and unique media processes create a world that is both scientific and passionate. Is embroidery a skill you learned as a child, or something you developed later on? My mother taught me to sew when I was a little girl, just simple stitching, and it was something I’ve always done. I never had any formal training. I don’t use proper stitches. I don't use techniques that have a tradition. How did you develop the stitches you do use? Just by spending hours and days and months embroidering. I started out as a printmaker in undergrad. I did a lot of silk screening, and would embroider over that. I used a cotton batting behind it to give it texture. I will use that in a lot of my outlined work. Yes! 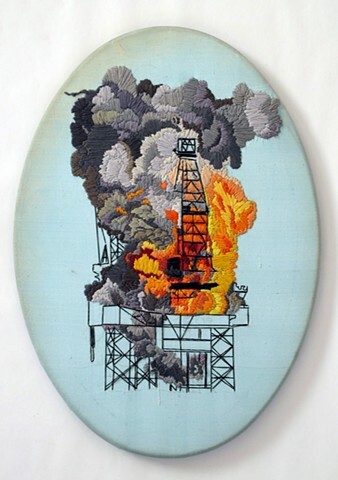 So far I've done three in a series of offshore oil rigs which have caught on fire… and exploded. Are those part of a larger series, like with the boats? A lot of my work is about the sea and the ocean. Man’s interaction with the ocean. It is definitely a unifying thing for all of us. The ocean reaches all of us, all continents and lands. It is a force of it’s own that we can’t really control. I think it’s the last area of exploration on the Earth. "Embroidery is my passion. It's what I feel most comfortable with so I always come back to it"
Oh yeah, I’ve heard that we know more about space than about the ocean… Even though the ocean is in the universe. [laughing] So how do you think you started choosing these sorts of things to make work about? Personal experiences? No, not personal experiences. I grew up in Atlanta, which was landlocked. I would go to the beach every summer. I loved water and swimming, but my work about the ocean is more about water being a universal highway. 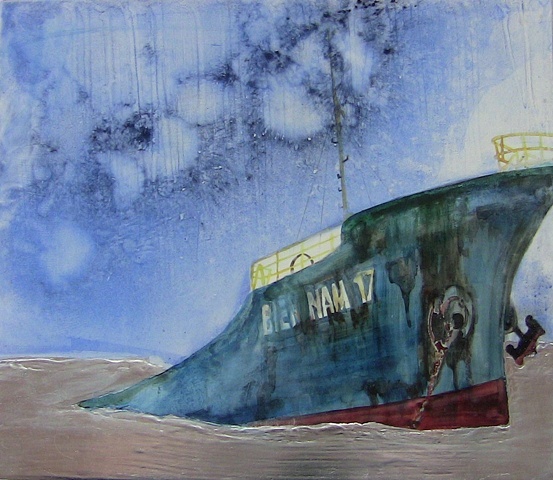 I started working on my shipwrecks in 2012. For a year I monitored shipwrecks internationally, collecting names of shipwrecks and what happened. There are blogs you can follow that have a lot of details. So I would take shipwrecks that I could find images of and appropriate those. 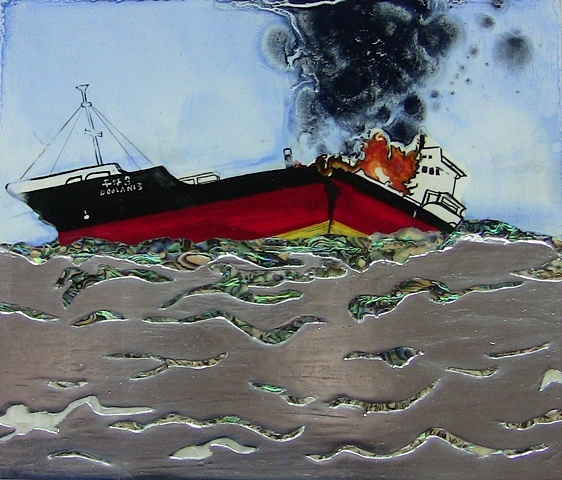 This was during the sinking of our economy, so the sinking ships was a way for me to express how I felt about that. It was also after graduate school and the majority of my friends were have a really hard time. 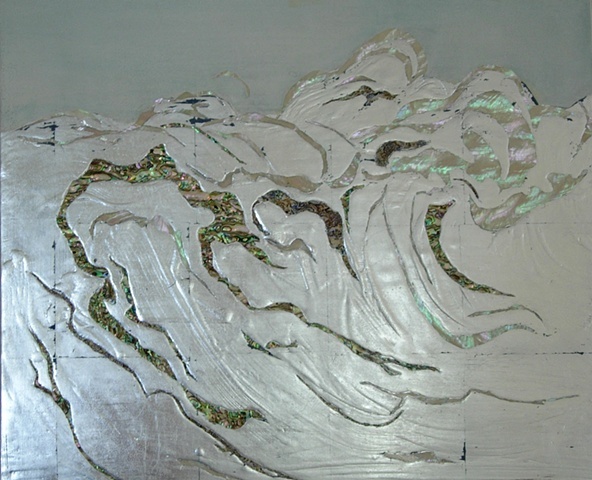 I used mother of pearl and silver leaf to juxtapose the sinking ships with luxurious materials. 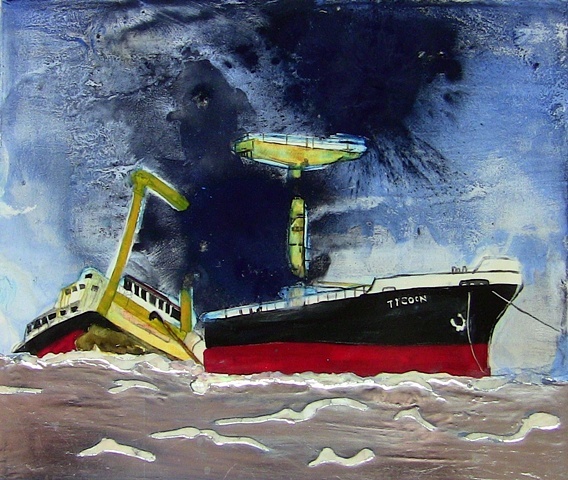 I find that a lot of artists collect things, so it’s interesting that you collect shipwrecks! I’ve never heard that one before… So all the materials you use are chosen on purpose. None of it is like, I need to figure out how to do this, what can I use? It’s more, I definitely want to incorporate this, how should I? Yes! I have a pretty broad practice. Embroidery is my passion, and what I feel most comfortable with, so I always come back to it, but I like making sculptural pieces and doing painting every once in a while. I’m into very process-oriented methods. Coming from printmaking, you have to be. It’s like manual labor! All the repetition. Printmaking gave me that physicality with a two-dimensional result. It’s the same with embroidery. It still has that tactile aspect. How has mixed media changed your work over time? I would say it corresponds with the subject matter, but I’m very interested in learning new techniques. When I was in grad school I took classes on automated sculpture, painting, drawing. I’ve done a little bit of everything & I’m always attracted to new processes. So the multimedia aspect doesn’t dictate what my work will be. Can you talk a little bit about your job with the San Francisco recreational parks department? I am a teacher there! I teach three adult sewing classes a week. It gives me an opportunity to meet people that I wouldn’t necessarily meet. I find that it empowers people to use their hands and actually produce things. Producing things is a daily thing for me, but for a lot of people, it’s not. They spend a lot of time on their computers or what have you. So for them it’s a great release. I also teach a class called Digi U, where we make a movie. Claymation or live action, etc. It’s for individuals who between the ages of 18 and 22 who are developmentally disabled or special needs. And then I teach a tween fashion class in which 8-12 year olds learn how to make their own garments and embellish them. "I find that it empowers people to use their hands and actually produce things. It's a great release." Wow! Those are very diverse! I really like working for the recreation and parks department. It gives you a lot of flexibility. You teach with another person, so you have a lot of support and can learn from their teaching methods as well. In the summer I will teach a range of children’s classes as well. Wow. I read that sewing is a skill that millennials just don’t have. They aren’t being taught by their parents, so it’s great that it’s something you are helping preserve. Yeah! They are taking home ec out of school. The classes are great because there is a range of people who want to learn to sew. All types of people. Using their hands. In the bay area because the tech industry is really prevalent, not everyone gets a chance to do that at their work. It’s so rewarding! So, has that changed your personal work? It has given me a larger appreciation for sewing, but I don't think it’s changed it a lot. A social practice project. I has a residency at Store Front Lab in the middle of march. The project is called The Society of Submerged Culture. It is bringing together historians, scientists, sociologists, swimmers, people with a general interest in San Francisco. It is focused on submerged aspects of San Francisco, whether it’s tunnels, shipwrecks, the ships that are buried under the financial district, individuals who swim in the Bay. That’s awesome! How is it going to be expressed? I’m turning Store Front Lab into the headquarters for The Society of Submerged Culture. It will be a place that people can come and read and explore! We’ll have lectures and workshops on creating your own artifacts. A workshop on how to create your own explorer kit. Movie nights with Jacques Cousteau & underwater movies! I’m working on the website and lining up individuals. So I spend a lot of time in my studio sewing by myself and I wanted this work to engage other people and about the city. So do you binge watch television when you sew? No, I usually listen to the BBC, Al Jazeera, or I’ll watch my nerdy documentaries about underwater things. So there’s a fabric art movement happening right now. Do you feel that you're a part of that? Or does it tickle you because you've been doing it for so long? I think it’s great! I do feel like I'm a part of it in some ways. I also work for the Textile Society of America, and that has really helped me put my claws into the textile world. I never really considered myself a textile artist, but mostly because I work in so many mediums so I’m not married to it. But textiles will always come back into fashion, they are so part of our daily life. From our bed to the clothes we wear. Do you have any advice for aspiring art teachers? Have fun! Enjoy it. The most important thing is to encourage individuals to make. The work shouldn’t necessarily please you. When I speak to students, whether I’m psyched about the work or not I always ask them how they feel about it. Because I think people should make art to express themselves, first. Do you think there is still a divide between fine art and crafting? I think the divide is really interesting. I never really considered embroidery to be craft and it wasn’t labeled that when I was in school, so I never really took that as a principle. I think the history of craft is really important and I don't think it’s separate from art making. I think it’s just your intention when you're making something. But I’ve also heard ‘crafting’ being used to make something less important than ‘fine art.’ Basically just in art history to keep women from being artists. Just misogyny. Yeah, pretty much! I think you can use the same materials to craft that you can to make fine art. Joseph Beuys is a perfect example. I think it is more your intention than the material or process. I have a good friend who is a textile artist and she knits. That is her art. Have you seen knitting graffiti? I have! I saw some in Moscow and in New York. Actually I co-teach with a knitting teacher and we did some graffiti. We did a five-finger knit and wrapped it around the bicycle posts so that when their parents picked them up they could show them their actual work. And it stayed up for a long time! So the children could actually see their work in society, not just a picture they drew, it was actually out there. Oh yeah, it’s so different to change a space. That’s really cool. There is a fabulous artist who lives in New York, Queen Olek, who crocheted a covering for an entire train. So, how did you learn to use mother of pearl? I worked in NYC for four years after college. I worked for this wonderful artist, Nancy Lorenz, and that is the process she does. 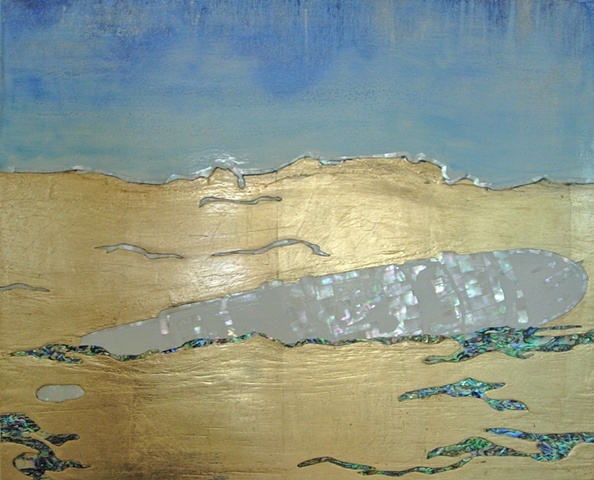 She works with with mother of pearl, gold leaf, and laquer. For a long time I was reluctant to use those processes because I associated it with being her studio manager and thought of it as her process, but as I found a different way to use it and make it my own I feel comfortable using it. It’s very natural for me because I worked at the studio for four years. It’s a very interesting combination of materials. How do you mix the watercolor and mother of pearl? These paintings are on wooden panels. The process is just layering. They are done with gouache with loose pigment over it, spread with shellac. Do you usually work very small? In graduate school I had the space & was able to focus on larger pieces. The embroideries tend to be small because they are so time consuming. I have piece that was like a five foot embroidery, but it was only outlined. My sculpture practice is quite big though. 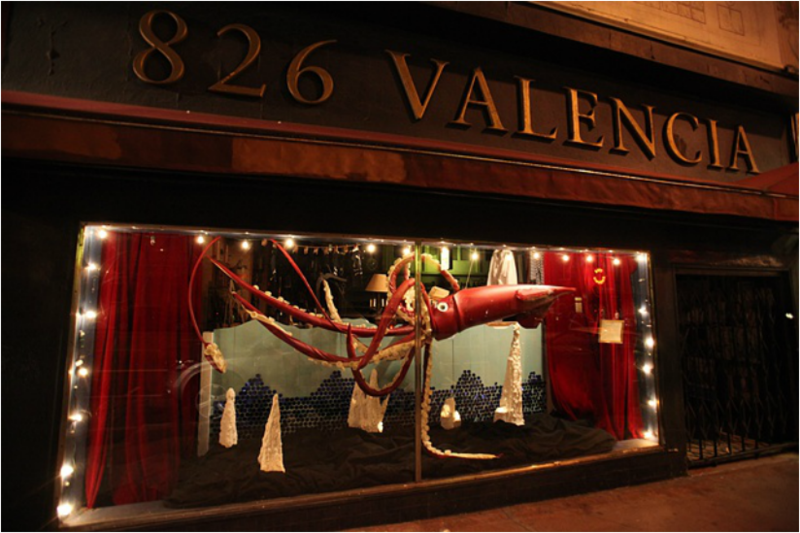 I made a sixteen foot giant squid at one point. But I’ve definitely scaled it down since grad school and it has made my work much more saturated and condensed. In school I was getting so much information and feedback and I was processing it by working really large whereas now I feel more focused and tend to work smaller.